The day after the game Eva was having an operation. It was the third time Eva was scheduled to have it. The first time she'd lost the letter and missed her appointment. The second, well the story is a little more embarrassing and dramatic but I can't really go into details. So we hoped third time would be the charm. 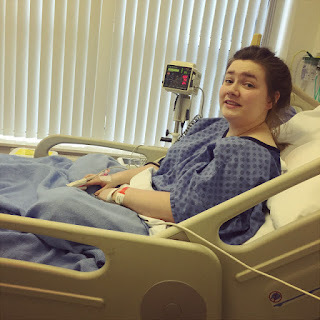 My mum was in England, so Eva, dad and I went to the day procedure unit for 8:30am. Poor Eva was starving because she had to fast from 10pm the night before, so she wasn't amused when she found out she was the one before the last on a list of seven. So she wouldn't be going in for her op until the afternoon. A small silver lining was that two hadn't shown up. We wasted time watching television. For some reason despite her hunger Eva wanted to watch the food channel and Come Dine With Me. I brought my Kindle. It was just after 1pm by the time they took her in. Dad and I then went to get a bite to eat, as my tummy wasn't happy I'd left it so long. On the way there I seen this guy and girl laugh at me. Literally looking at me and laughing. She tried to elbow him to get him to stop, despite the fact she was laughing too. I wasn't upset by it or anything, if anything I was just surprised. On one hand that they were so blatant and on the other by the fact I was kind of shocked. I think the fact I was surprised it happened shows I'm lucky enough I really don't come across that anymore. We went to Costa and I got a panini, latte and a Christmas cornflake bun. 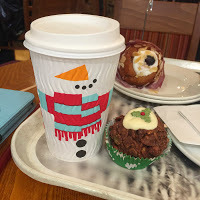 I'm really loving Costa's range of festive to go cups. After that we went to the Yankee store and myself and Eva two candles each, then headed back to the hospital. We didn't have to wait long until Eva got back. 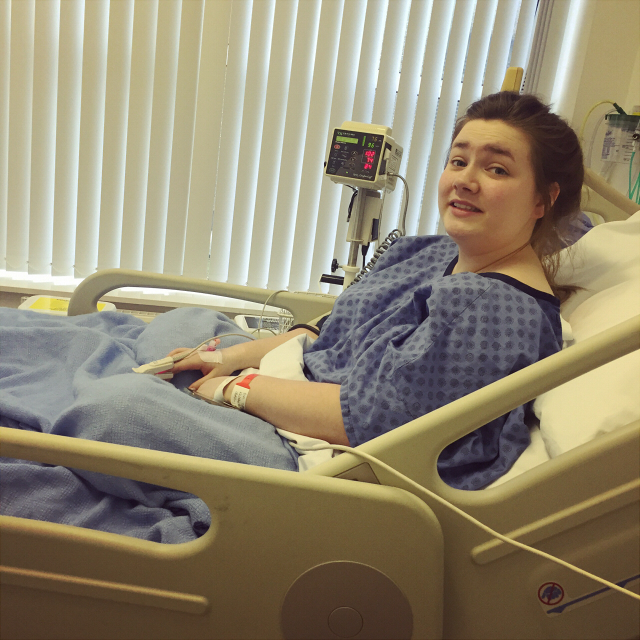 After some observation and tea and toast she was allowed to go home, but when she got up to change, blood started pouring from her wound. It was like a massacre, all over her and the floor. The nurse had to come in and clean her up, and we were stalled from leaving again. Eventually we did actually get to leave, and the first place we headed was McDonalds so Eva could get more food. The rest of the evening and the next couple of days we just chilled, mostly watching The Vampire Diaries and Gossip Girl. Eva was forbidden from doing any of my manual handling etc, which was tricky without mum here. By Thursday I decided I'd recovered enough from my cold to go back to class. I'd caught up with the work I had at home, but I was still a little nervous. Class went okay, but I found out I have a practice controlled assessment this week and next I have a formal presentation to do in front of the class. I don't know what I'm more nervous about, as I don't really feel like I've clicked with Of Mice and Men but speaking in front of people is the worst! Eva suggested I do it about Blackfish, Seaworld and keeping Orcas in capitvity. 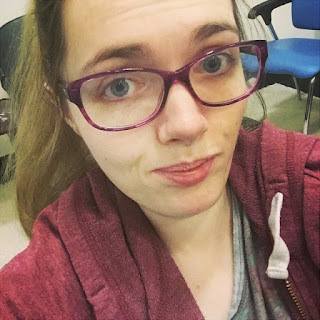 So I feel a little bit confident I can talk about that, I mean I've already written about it. I might not make it to class this week to do the practice assessment anyway, if the weather keeps up. It's been so cold. The type of cold not even bed can protect you from. If I don't make it to class though I'll do it at home and email her it. Luckily the actual assessment isn't until after Christmas. The weekend was rather non-eventful, other than FINALLY getting my Christmas decorations up! I relaxed on Friday, went to my grandparent's house on Saturday and my aunt visited as usual on Sunday. My granny hadn't been very well during the week, but my Saturday she'd picked up quite a bit since starting antibiotics. Yesterday I received my Christmas present from my best friend Gary. He wanted me to open it early to make sure it was okay, in case I wanted to send it back. Not that I'm the type of person to exchange presents anyway. On my Christmas Wish List I'd listed the Anna From Frozen Animator Doll and mentioned that I'd really love Elsa, but the Disney store had been out of stock for a long time. 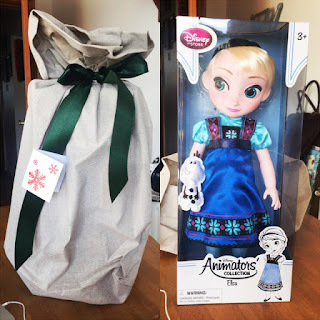 Well being the awesome friend that he is, he tracked down an Elsa doll and got me it for Christmas. I never even imagined when I opened the box to find this lovely wrapped gift that inside would be Elsa! There was stunned silence for a bit before a lot of 'oh my god' and hugging the box. I'm such a lucky girl. There really aren't words to describe how happy this present made me. I'm also glad I got to open her early, because she got her own special day. 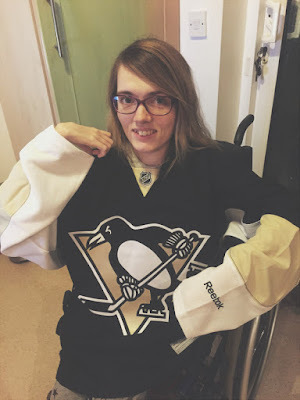 Today I had another lovely surprise as the Pittsburgh Penguins jersey I ordered a couple of weeks ago from usasports.co.uk arrived. Apparently it didn't have any address on it, but the postman guessed it was for us? Weird. I'm glad he did though. As you can see it drowns me a lot, but that was expected. 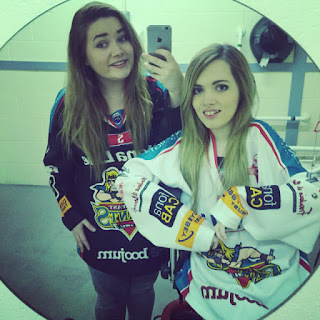 I had to get an adult small, and my Belfast Giants' adult small drowns me and I knew US sizes are even bigger. Still, I LOVE it. I wanted to keep it on because it's so toasty warm, but I was too worried I'd get stuff on it. I'm going to get suit bag things to keep my jerseys in, to keep them good. That that was last week and this week so far. Something else did happen last week, but I'm going to hold off writing about it for now. So I'll leave you wondering. 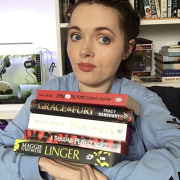 My next post will be the Christmas tag and after that I hope to get round to doing a review on a book a read recently. It's been forever since I did a Bloo's Review.